Working as a carer is a calling. The job demands patience, respect and a whole lot of creativity – especially if you’re taking care of a patient with dementia. But just like in all industries, there are unfortunately people in the job who aren’t cut out for it, but it’s extra tragic when a carer neglects their duties – after all, you’re being trusted with another person’s life. The Marsden family suspected that their mom’s carer wasn’t a trustworthy person. Amongst other things, Gina thought that the carer was lazy and wasn’t doing enough, reports Yahoo News. But when she set up a hidden camera, she discovered that the situation was worse than she had suspected. What she saw on the video, which was sent live to her phone, made her rush home from work to intervene. Carer Stacey George, 46, was filmed hitting Sabina Marsden, 78. “God you stink,” the carer says as she snatches a blanket from the woman’s knees, leaving Sabina half-naked and sobbing. The Italian-born grandmother and widow can be heard muttering “Mamma Mia” as the carer hits her 5 times. Sabina Marsden’s daughter Gina Owen saw the shocking attack in real time, after setting up a camera that sent live video to her phone. Daughter Gina, 46, works in a nearby electronics store and rushed home from work to intervene. The camera catches her storming into the room and comforting her sobbing mother. Gina confronts the carer and tells her to get out of the house. The carer casually eats the rest of her snack before picking up her handbag and leaving the room. 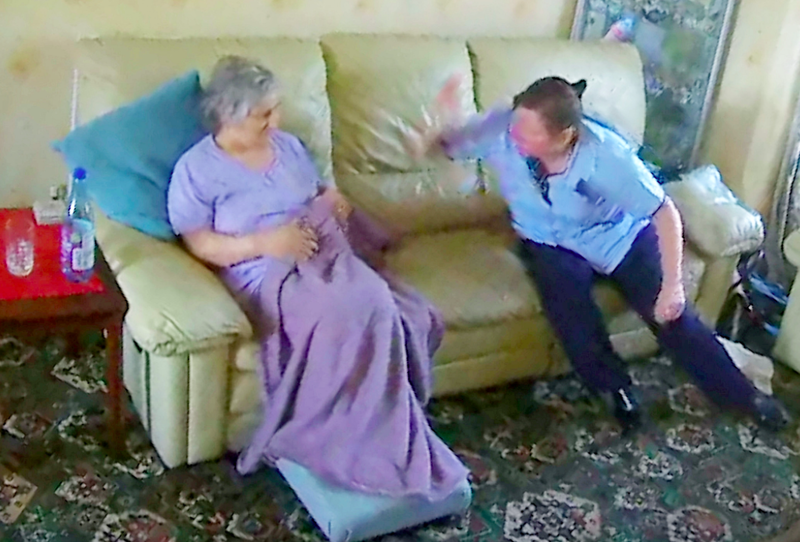 The family took the tape to the police, but the carer was let off with a warning after admitting to assaulting Mrs Marsden on June 13th last year. That’s why the Marsden family has now released the video to the public. They want to warn other families just in case Stacey George is still working as a carer in Britain or elsewhere in Europe. I’m glad they’re speaking out – a person like this has no business working in the care industry! I know for a fact that there are many people working tirelessly in the care industry to bring the best possible care to our vulnerable family members. They rarely get recognition, but without them where would we be? 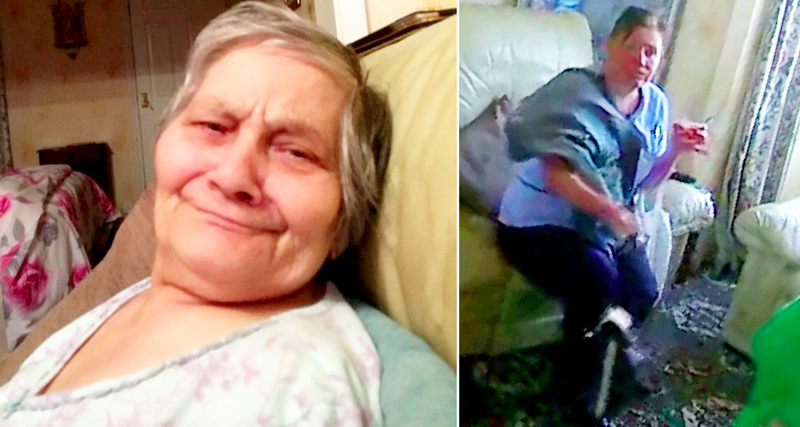 But there are also people who should NEVER be allowed to set foot in a care home, and I hope that the disgusting woman behind this attack ends up behind bars for a long time. A warning isn’t enough for someone who behaves like this – share if you agree!